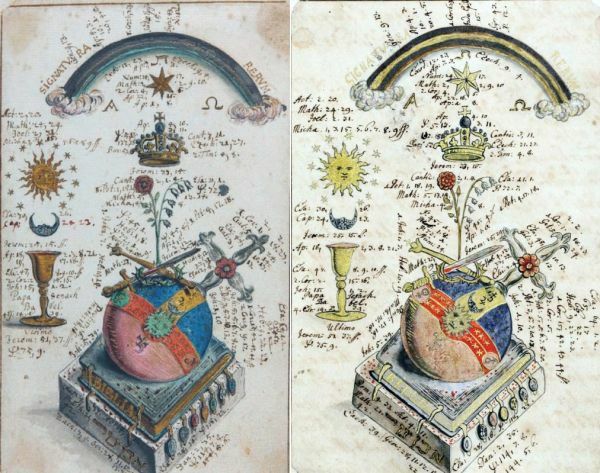 Here is a rather strange alchemical emblem with biblical overtones found in two 18th century German manuscripts. One is in Manly Palmer Hall MS 19 which is entitled Das Buch mit Sieben Siegeln (The book with seven seals). It is dated broadly to the 18th century. The other, slightly better drawn, version is in Mellon MS 110 which is dated to 1760. The text is mystical and alchemical with elements of apocalyptic speculation which informs this particular image. Here I show the Mellon on the left and the MP Hall on the right. At the bottom we see a stone plinth on which is placed a book with seven seals. It is entitled 'Biblia'. On top of this is an orb topped with a silver cross and red rose. The orb has its lower hemisphere coloured reddish brown, while the upper part is in cerulean blue with little golden stars. The bands around the orb bear the symbols of the seven planets. On top of the orb are a sword and a sceptre set crosswise, at at their intersection is a crown of thorns. From this rises up a red rose on the left and a sprig of the Solomon's Seal plant with its white flowers. Above all this is a golden crown. High in the sky is a rainbow, the 'signatura rerum', together with a seven pointed star, and the Greek letters Alpha and Omega. On the left is a golden chalice with a Moon and Sun. Every symbol bears multiple references to Biblical texts. It would probably throw some light on how to read this image, if one were to list all the Biblical texts, however, this is not straightforward as these will be to some German Bible and the verses may be differently ordered in the English bibles, so I have not found the enthusiasm to do this, but it would be instructive.